Most of you that read the blog on a regular basis know that I was really intrigued by the idea of “prescribing information and technology” early on. 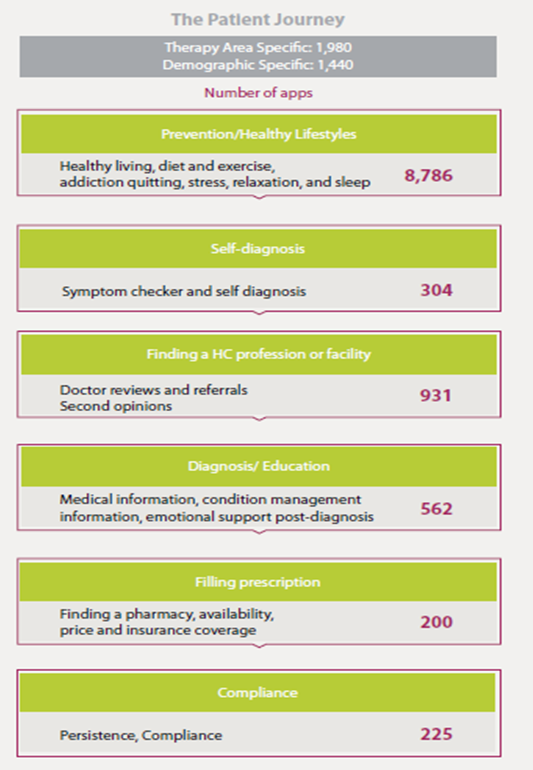 With 90,000 different health related applications, the question is which ones should you use and how should you find out about them. Happtique started to get into this space earlier in the year, and I spoke with them at length about integrating this into a care management platform. I was really surprised to learn that IMS Health which I think of as a healthcare data company was jumping into this space. By applying cutting-edge analytics and proprietary application suites hosted on the IMS One intelligent cloud, the company connects more than 10 petabytes of complex healthcare data on diseases, treatments, costs and outcomes to enable our clients to run their operations more efficiently. Drawing on information from 100,000 suppliers, and on insights from more than 40 billion healthcare transactions processed annually, IMS Health’s 9,000+ expert resources drive results for over 5,000 healthcare clients globally. Customers include pharmaceutical, medical device and consumer health manufacturers and distributors, providers, payers, government agencies, policymakers, researchers and the financial community. I also read their press release about their new solutions. IMS Health today announced the immediate availability of AppScriptTM, an mHealth app prescribing solution designed to help healthcare providers and health plans create proprietary formularies based on an objective assessment of healthcare app functionality and value. The company also announced the launch of AppNucleusTM, its customizable, cloud-based hosting platform that will enable developers to build secure, industry-compliant healthcare apps at very low cost. Both new products will leverage IMS Health’s comprehensive data on diseases, treatments, costs and outcomes. The AppScript Software-as-a-Service solution classifies and evaluates more than 40,000 mobile healthcare apps currently available for download on iOS and Android platforms, categorized by stage of the patient journey. Each app is assessed using the company’s proprietary IMS Health AppScore, which ranks apps based on functionality, peer and patient reviews, certifications, and their potential to improve outcomes and lower the cost of care. 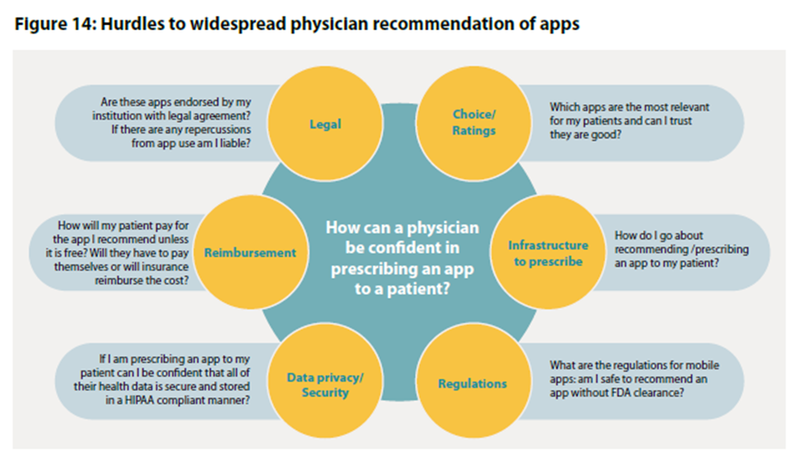 As part of wellness, prevention and treatment regimens, physicians can organize these apps into formularies based on their specific patient population and practice preferences. In addition, AppScript enables them to securely prescribe, reconcile and track app use by patients from any mobile interface. AppNucleus is the company’s innovative healthcare app development and hosting platform that makes it easier for app developers to offer HIPAA- and HITECH-compliant solutions. The platform, compatible with all mobile operating systems, uniquely integrates IMS Health information and analytics at every stage of app development to support design and performance evaluation decisions. AppNucleus features a suite of plug-and-play solutions, enabling patients and physicians to exchange health information on mobile devices via a secure, encrypted channel to protect patient information. It also offers app developers a highly economical way to build security into their apps and protect patient information. First off, I quickly learned that I missed a very interesting report that they put out in October. 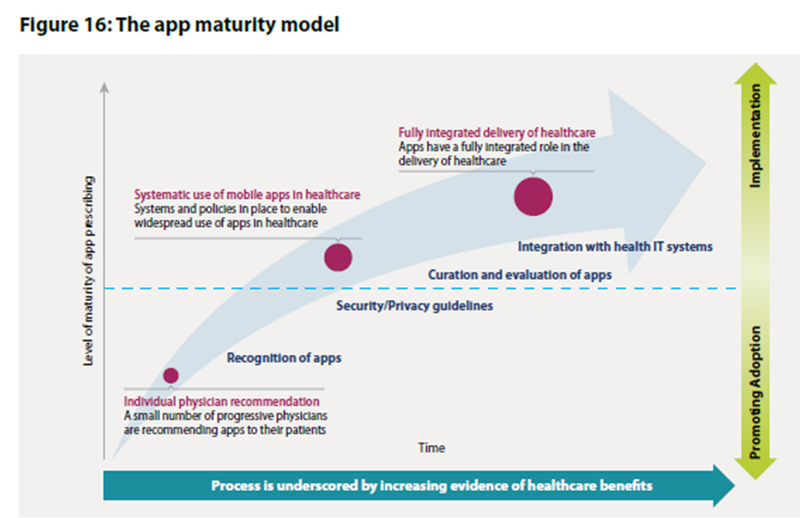 This report titled “Patient Apps for Improved Healthcare: From Novelty to Mainstream” has lots of great information which I share below. It also is essentially the business case for these new solutions. In talking with Matt, he shared with me how IMS Health, a 60 year old company, is using their consumer solutions group to transform how people learn and manage their health. He talked about how they want to make mobile safer, more effective, and easier. I really wanted to understand how they determined where to look given all the apps out there. A lot of it is in the report, but he shared how they looked at 40,000 apps and used over 25 different criteria (such as type of information, functionality, communication process used) and peer reviews to determine a shorter list to focus on. We discussion how the short-term success of mobile is engagement, but the long-term success will have to be tied to clinical outcomes. The physician would be using a white labeled platform (provided by their health plan, provider group, others). They would select an app based on a curated formulary. The patient would get a secure e-mail or a text message with a link to the app. The patient would follow the link and enter a proprietary passcode. This would take them into the app store. They can then download the app. This process will allow them to track “intent to download” and then whether they did download. The key next step will be partnering with the apps and getting the patient consent to pull data back to know not only if it was downloaded but whether it was used and how often. And, ultimately, this will have to be integrated with the provider platform. We talked a little bit about why IMS and he talked about their knowledge of the prescriber and ability to recommend apps for their formulary based on their patterns of prescribing. How are the apps evaluated? Do clinicians evaluate the clinical algorithms? How do you determine the financial viability of the apps? Are they one-hit wonders or shiny objects or will they be around for years. How do you modify the “formulary” based on user and prescriber feedback? How do you integrate the tools into the physician’s workflow? Only about ½ of the 40,000 apps they looked at justified a deeper dive. They also looked at apps by therapy area and by which part of the patient journey they focus on.